The Focal Point for LVE in Malaysia, Shahida Abdul-Samad, was one of the pioneers that attended the LVE’s first Train-the-Trainer Seminar in 1997, held at the Global Retreat Center in Oxfordshire, United Kingdom. As LVE has just begun, no one was representing Asia. Shahida shares, “I personally took the challenge of sharing this knowledge and building LVE country coordinators in Singapore, China and Indonesia. I also conducted trainings for NGO representatives based in Siem Reap. Teachers and students loved LVE. There are variations of the main LVE training as it had to cater to the needs of different populations, to refugees, drug addicts, street children, victims of natural disaster, and so forth. As of today there are 15 LVE values-education resource books, catering to differing needs. As LVE started to spread all over the world and secure a name for itself in the international arena, I was invited to share the Malaysian experience with the Ministers of Education for the Arab States in Beirut and later on at the Early Childhood Care & Education Conference at UNESCO Headquarters in Paris. LVE was accepted and recognized internationally by the United Nations Education and Scientific Organization (UNESCO). Based on my experience and background in leading Quality Improvement initiatives in the corporate sector, I realized that there was a critical factor in bringing our change: the importance of creating shared values amongst the stakeholders. This was consistent with the Living Values Education approach and it reaffirmed my belief and deepened my understanding of how to facilitate to this understanding amongst the owners of the improvement process. Initially I focused on training teachers in private schools, but later realized that it was government school teachers that required this training. Private school teachers were well equipped and had experience in the aspect of developing the emotional and social wellbeing of the child, whereas the focus of the government schools was mainly the intellectual and physical domains. The ease of measuring the improvements in these two areas contributed partly to this imbalance. The two large government institutions I worked with were MOE and the Department of National Unity (DNU) directly under the PM’s department. MOE focused mainly on primary and secondary education and the DNU focused on preschools. With the support of three key people the Living Values Education program started to make inroads. Even as I write this, these three people are still very involved and supportive of LVE. It is with their support and commitment that LVE has got this far in Malaysia. They are Dr. Siti Hawa, Rahimah Sura and James Wong. At the beginning they were all skeptical. They only started believing in LVE’s effectiveness after they attended the training sessions themselves. They became more convinced when they saw changes take place upon its implementation and witnessed first-hand the positive changes that the LVE approach brought about in teachers’ attitudes. The atmosphere of each classroom and the school changed and the learning environment transitioned to a positively charged space. I remember vividly Rahimah’s comments after the LVE training ended. She said, ‘Shahida, I promise you I will try and implement what I have learnt from you and Diane and see if it works. I will do that. If I see results, I will let you know. That’s my commitment to you.” The rest, as they say, is history. In every school Rahimah headed, she implemented LVE school wide. From inner city schools with major disciplinary problems, to rural schools with drug addiction problems, to the best boarding schools with teachers challenging her positive teaching strategies, she was able in every instance to turnaround each and every school to become the Malaysia’s best schools; they attained national awards. Children who were drug abusers became actively involved in drama and dance and won competitions locally and nationwide. Teenagers who used to destroy toilets and common facilities turned over a new leaf and took responsibility for the cleanliness of their toilets. They took pride in what they did. Destruction and vandalism dwindled down to zero. Today these schools are the Exemplary schools. They receive the highest of school rankings. From being in the worst band of D, they moved to the highest band of A. Not only did the positive environment impact the school and its inhabitants, the positive energy overflowed to homes and community, bringing parents and community leaders together – all lending their support to further Rahimah’s effort in the ‘magic’ she created. It wasn’t easy for her in the beginning. As usual there was resistance to change. She persisted in the belief that this was the way forward; bringing about change using LVE’s Theoretical Model as her compass. The use of canes was thrown out; students were given the freedom to move from classroom to classroom without being monitored; teachers who refused to follow the LVE approach were counseled and encouraged to use the techniques and activities from the LVE activity books. She asked for the Living Values way. With Rahimah’s skill set and experience in implementing LVE through PBB, values activities and setting clear guidelines that everyone adhered to, the teachers’ hearts and minds began to change. Rahimah proved that LVE wasn’t just magic or something that happened by chance, it was a systematic and well-designed program which brings out the best in all of us – our innate values. Rahimah went on to be honoured and recognized by the MOE and was awarded the highest award a civil servant can achieve due to her untiring efforts to bring about positive change through LVE. James Wong was the accidental hero. In the beginning he did not believe in LVE nor its approach. A very cynical man, he told me straight to my face that these type of techniques don’t work and to stop wasting his time. At that time he was the Director of National Unity for Kuala Lumpur and in charge of the teacher-training programs for preschool teachers. As far as he was concerned the most effective way to motivate people was through monetary rewards. The other method he felt worked: to motivate through punishment by reprimanding and sending warnings. He believed internal motivation techniques were short term. I pleaded with him to give me a chance to try out the LVE approach. Due to my persistence, and his own realization of his negative attitude, he gave me a chance to do an LVE training. The ‘training’ was actually planned as a reward for teachers: it included an excursion to a hill station so the teachers could relax, enjoy themselves and go shopping. Nobody was interested in attending a training, especially after a tiring day of walking up and down the hilly plains of Cameron Highlands and shopping. Even though the time allotted to me was short and the teachers were tired after the day of shopping, their mood changed as soon as I began the session with ice breaker bingo. Laughter and excitement filled the room. When they were ready to listen, I started with the Values Awareness sessions and the self-discovery process began. Their interest in the program grew. The manner in which the training was conducted was so different from anything they had ever experienced. Interactive, attentive, interesting were some of the adjectives used to describe the session. The very next day, at 8:00 in the morning, all 100 of them were at the session on time. They were ready to learn and absorb as much as they could in the remaining three hours we had together. James couldn’t believe the impact of LVE on the teachers. He became a champion of the LVE training and encouraged all the state directors to train their teachers and trainers. Today, James Wong co-facilitates these session with me. He admits that it has made him a different person. His personal relationship with his wife and daughter has improved tremendously. Today the Living Values Education program has trained thousands of preschool teachers and schools in Malaysia. Over the last 16 years, LVE has reached even the most remote of areas in Malaysia with its poorest and the most deserving children and teachers. One story I would like to relate is about a visit I made to the coordinator of the Unity Department. We were to talk about the next program we were organizing for a group in the state administrative capital, Putrajaya. At the meeting, I happened to be sitting across the table from the Head of the School Inspectorate of the Ministry of Education as he was keen to find out why the Department of Unity teachers had such a different style of teaching from the other teachers he was evaluating for the National Award of Best Teacher in 2015. As we talked, I asked him what brought him to the Department of Unity Kindergartens. He told me that what he had observed of the one of the teachers from Sarawak, in a very remote village in Borneo, amazed him tremendously. He described the way she spoke to her children, her tone of voice, her calm nature and the atmosphere of love. He told me that she didn’t raise her voice and yet the children obeyed her, and she managed to accomplish her lesson plan objectives effortlessly while enjoying the process herself. When he described this to me, I knew in my heart that this teacher must have attended the training I had conducted in Sarawak a few years back. To make sure she was one of my students, I noted down her name and managed to get the contact number. When I asked the Department of Unity’s coordinator to check if this person was one of the participants at the Sarawak LVE training, she confirmed that she was. I called her the next day and told her that I heard that her kindergarten was nominated as the best kindergarten in Malaysia due to her efforts. She was elated. She told me that she could only have achieved this success because of the LVE training she attended in Kuching Sarawak. She never had thought before that she could turn around a group of poor children who couldn’t even read and write to being the best kindergarten in Malaysia. She went on to win the 2015 Award for Best Teacher and Kindergarten in Malaysia! The LVE approach is unique, and it is something that can be taught to others. I documented the process of how to do this effectively when I was asked to contribute a chapter to a book by Dr. Terry Lovat, a values-education researcher and former Dean at Newcastle University Australia. The book, ‘International Research Handbook on Values Education and Student Wellbeing’ was published in 2010 by Springer. This was a great honor for me as all the other contributors were Ph.D. holders. I was the only one with hands on experience and the expertise of how to create a values-based atmosphere in a learning environment. There are thousands of success stories that I would like to share, and I plan to do it after I retire from working life. I have dedicated the last twenty years of my life and given up what could have been a very successful corporate life in the largest Fortune 500 company in the world. Do I have any regrets? James has become a changed man. He’s calm and he listens to others. People no longer fear him or shudder at the thought of him humiliating them for their mistakes. James openly admits his mistakes and has apologized to the teachers and officers he may have hurt before his awareness of LVE. Today, James is a certified LVE Trainer and committed to LVE. Despite a deteriorating illness, he takes time to attend training sessions and co-facilitates with me. He has realized that it was through his own childhood experience of being bullied and humiliated by his class teacher that he learnt to bully and humiliate others. He has made amazing strides to be a better father, husband, colleague and is a great LVE spokesman! Dr. Siti Hawa is in her seventies has retired from the Ministry of Education. She continues to support LVE and is a good friend of the LVE community in Malaysia. Thank you, Rahimah. Thank you, James. Thank you, Dr. Siti. The following story of an educator’s personal and professional growth after encountering LVE was shared by Shahida Abdul-Samad, the Focal Point for LVE in Malaysia. The educator, Mrs. Sa’amah, related her story: “Thanks to Allah, I am grateful for the opportunity to participate in the Values Education Course organized by the International Institute IQRA with the Department of National Unity and National Integration for Main Coaches. I gained a lot of knowledge during my participation in these courses. Before this, I felt myself to be just an ordinary person who did not have any privileges. I always blamed myself for what happened, even though there were times when things that happened were not because of me. I had no confidence, and I did not know what the goal was in my life. Endowed with two special children made me feel more depressed and frustrated. I always said to myself, what and why. I once said to my mother, ‘Why is it like this?’ My mother said, ‘God will not test one of his servants for no reason. God cares for you and perhaps it is because you have a high level of patience that is not had by others.’ While I accepted what my mother said, I still blamed myself. The same went for my career. Over the years I felt less appreciated because my career is that of a kindergarten teacher. I felt I failed in my studies when my friends were successful in getting higher positions. I felt pressured and disappointed. It was easy to feel angry, and I expressed my anger, sadness and frustration with my children and husband. But, with the blessing of Allah, I was able to participate in the Living Values Education Course. This is where I came to know who I am. It brought to my awareness the beauty of life. There I learned about the twelve universal values, of peace, cooperation, responsibility, simplicity, freedom, tolerance, honesty, humility, happiness, love, unity and respect. I also learned a wide range of activities such as pure recall, imagining, quietening the self, painting, personal development activities and enhanced skills for social integration. This was the start of the peace I was looking for. I was scared and excited when an educational officer asked me to organize educational workshops for teachers in each district in the state of Johor. Thanks to Allah, I was successful in implementing the program and the feedback I received was quite impressive. They said values education should be improved, especially today when values are increasingly disappearing. My children, husband and family members also said that I am no longer the mother they knew. My students are now always saying, ‘I love my teacher.’ Every day they would hug me and some said, “Can you tell my mother to hug and love me like teachers do?” I was overwhelmed with happiness. On this day, I feel life is very beautiful. I now realize and understand my responsibility as a human being, as a child, as a wife, as a mother, as a teacher and also as a citizen of Malaysia. Shahida Abdul-Samad, the Focal Point for LVE in Malaysia recently wrote about an educator’s reaction to an LVE workshop Shahida and Diane Tillman conducted 15 years ago. 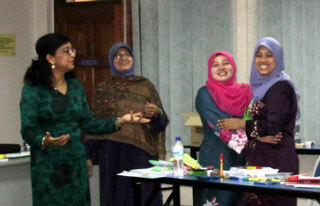 Shahida wrote: “I remember vividly Rahimah’s comments after the LVE training ended. She said, ‘Shahida, I promise you I will try and implement what I have learnt from you and Diane and see if it works. I will do that. If I see results, I will let you know. That’s my commitment to you.’ Every school Rahimah Sura headed she implemented LVE school wide. From inner city schools with major disciplinary problems, to rural schools with drug addiction problems, to the best boarding schools with teachers challenging her positive teaching strategies, she was able in every instance to turnaround each and every school to become the best schools in Malaysia attaining national awards. Children who were drug abusers became actively involved in drama and dance and won competitions locally and nationwide. Teenagers who used to destroy toilets and common facilities changed over a new leaf and took responsibility for the cleanliness of their toilets. They took pride in what they did. Destruction and vandalism dwindled down to zero. Today these schools are the Exemplary schools. They are rated highest amongst school rankings. From being in the worst band, they moved to the highest band, i.e., from D to A. Not only did this positive environment impact the school and its inhabitants, the positive energy overflowed to their homes and communities, bringing parents, community leaders together – all lending their support to further Rahimah’s effort in the ‘magic’ she created. It wasn’t easy for her in the beginning. As usual there was resistance to change. She persisted in the belief that this was the way forward – to bring about change using LVE’s Theoretical Model as her compass. The use of canes was thrown out; students were given the freedom to move from classroom to classroom without being monitored; teachers who refused to follow the LVE approach were counseled and encouraged to use the techniques and activities from the LVE activity books. The LVE Team in Malaysia recently finished a Living Values Education Train-the-Educator Workshop for the teachers of the Department of National Unity and National Integration. This was led by Shahida Abdul Samad, the Focal Point for LVE in Malaysia, and James Wong at the Institute Aminuddin Baki, Genting Highland, on October 25-27, 2013. They have trained 65 teachers this year and plan to monitor the teachers on their implementation of their newly learned Living Values Strategies in their respective kindergartens. Malaysia's Focal Point for LVE, Mrs. Shahida Abdul-Samad reports a busy 2009 for the Living Values Team there. They have conducted four LVE Educator Trainings and one TTT covering both East (Borneo) and West Malaysia. 321 preschool teachers and assistant teachers successfully attended the workshops in the states of Perak, Kelantan, Pulau Pinang and Sarawak. These trainings are part of an effort to train all preschool teachers from the Unity Kindergartens so that preschoolers and their teachers can benefit from a conducive and positive learning environment. Similar workshops were conducted in 2006 and 2007 in the state of Negeri Sembilan and in Kuala Lumpur key teacher trainers were selected to attend the program. In April 2009, LVEP Malaysia took part in the National Values Education Conference in Canberra Australia. Shahida was invited to conduct two workshops at the conference where participants were able to get a flavor of LVEP and the process of the trainings that we conduct. In November 2009, LVEP Malaysia assisted our sister organization, LVEP Indonesia, in conducting the LVEP Train the Trainer workshop for representatives from NGOs from all over Indonesia. In 2010 we plan to deepen our existing efforts with the kindergartens by emphasizing the importance of implementing as many values activities as possible as well as educating parents about the program. Before LVEP, I hated myself & my life. I never felt appreciated. After practicing the skills I learnt, my life is now calm and peaceful. I am happier & grateful for what I have – my family, my career & my friends. I now share this LVEP knowledge when I conduct trainings. I am touched by the stories I hear. I now realize how beautiful life is! Let's not destroy it. My father has always told his children that we must all give something back to our country which has given us so much. I never knew what it was or how I was going to do it - until I attended the LVEP TTT program. I realized that this is what my father told me and I have volunteered myself to become a LVEP trainer. As the director of the State of Johor and now the State of Penang, I was pleasantly surprised by the change that was brought about my two teacher trainers who attended the LVEP training conducted by Shahida. Not only did they both win the 1st and 3rd prize at the National Level for the best kindergarten in Malaysia but just going and visiting their kindergartens is truly an living example of peace and love and a teacher who unconsciously has created it through her positive role model and skills acquired at this program. I have a boy in my class who never used to communicate due to his mother tongue being Thai. That was a problem I didn't know how to manage. I tried different approaches but it didn't work. After attending LVEP, I started practicing "Positive Behavior Building Skills" and using "Praise" as techniques to bring about the change in him. Now he is a confident little boy who wants to learn & communicates well. Even though my involvement in this program has been that of a coordinator, I have learnt new ways. I have practiced LVEP at the office and my colleagues are surprised at the change in me. At home, I have started Circle Time with my family. We do this as a ritual every night. Everyone shares their positive feelings about their day. This type of communication has enriched my life as a mother and I feel more genuine as a human being. Besides being teacher trainer I also work closely with the community especially the Jiran Wanita as well as the police. At one of my training session, I applied the techniques I learnt from LVEP and the person most impressed by my approach in introducing values, was the Bilal of the local mosque. Being a non-muslim, I felt so inspired that this program can transgress racial and religious beliefs and can bring us to see the good in all humankind. The women in the community are asking for more values courses. It was a challenge for me as a teacher to ensure that there was enough students in my tabika and to meet the necessary requirements of the Department. After attending LVEP and applying the tools and skills I have learnt, there has been a change in the environment in my tabika - the children, parents and the teachers can feel it and see it. The impact – the enrolment in my tabika has increased!! I used to be a very strict person and I wouldn't hesitate to met out severe punishment and instill fear in others – this was how I would control my class and my life. After LVEP, I have come to realize the loving and caring nature in myself. I like being that way. I also created the "LUVRS garland" in my class to acknowledge the positive qualities of the children. Even my husband can't believe the NEW me is here to stay!! Presentation of the "Living Values Young Adults" book to Her Royal Highness Tuanku Najinah Bte. 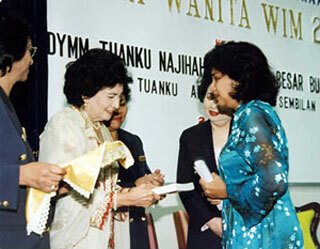 Tunku Besar Burhannudin in celebration of Women's Day, 24th August 2001 at Women's Institute of Management, Malaysia. Living Values Education in Malaysia (LVE) is in its 7th year of implementation. Since its representation at the veryfirst Living Values Educational Initiative Train-the-Trainer session in 1997 at the Global Retreat Centre in Oxford, England, the Malaysian team has never looked back! In Malaysia, Noble Integrated Childhood Education (Malaysia) Sdn. Bhd. 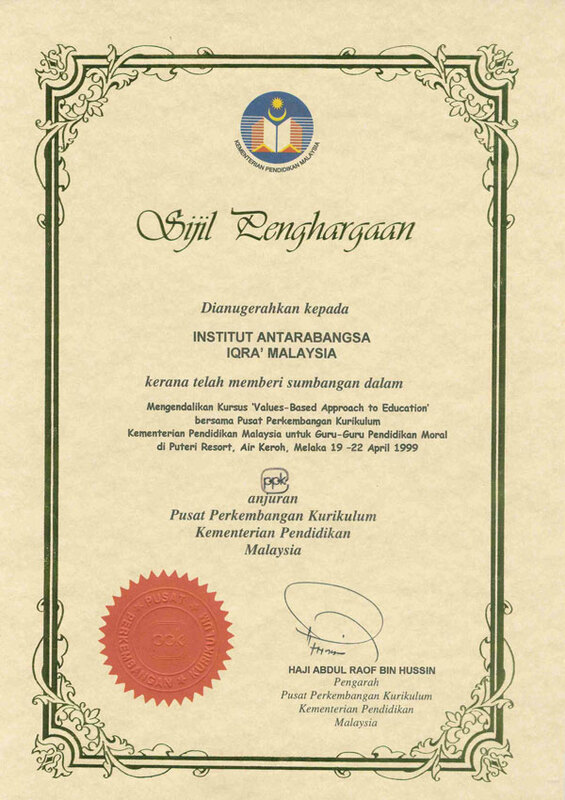 (NICE) is the national representative for Living Values Education in Malaysia. It is headed by Ms. Shahida Abdul-Samad who also assists in LVEP activities in the region of South East Asia. NICE is an Institution of Higher Learning accredited by the Ministry of Education Malaysia and the Selangor State Department of Education. "Seeing that we have slightly more than five years left before the 21st Century, we certainly have a lot of work ahead of us. We believe that it is our duty and responsibility of our present generation to do something for our future generations. We would have failed in our endeavours if we do not respond positively to this call of duty." 22-23 Dec, Selangor: LVEP TTE for teachers from Sri Dasmesh School Core team of 30 teachers for private school in Kuala Lumpur. 10-11,13-14 Nov, Selangor: LVEP TTE for Sri KDU Smart School The participants consisted mainly of new teachers. Many expressed the benefits of the reflection and how it made them relate to their inner values. They recommended that this program be conducted for all parents and caregivers. 17-18 Oct, Pahang: Intro to LVEP for Kindergarten (Tabika) teachers under the Ministry of National Unity and Social Development This was a first for us as the training was done completely in Bahasa Melayu. 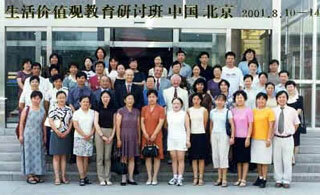 It was very well received and more trainings for the Ministry of National Unity and Social Development are expected in 2004. 12-14 Sept, Selangor: LVEP TTE for SRI KDU Smart School Facilitated by Shahida, Hamidah Merican and Pauline George. Participants felt that they gained so much in these three days and experienced the magic of LVEP work! 6-8 Sept, Selangor: LVEP TTE for SRI KDU Smart School Malaysia's premier Smart School, Sri KDU aims to introduce a values-based educational system in 2004. The principal was totally committed to the aims and objectives of LVEP and she sent all the teaching staff to attend the program. Session facilitated by Shahida, Kana (Singapore Country Coordinator) and Patricia The. 12 Aug, Penang: LVEP Introduction Talk for ASEAN participants Mathematics and Science teachers from nine ASEAN countries attended a three-hour introduction to LVEP. Facilitated by Ruth Liddle, South Korea Country Coordinator. 11 Aug, Penang: Introduction to LVEP for counselors of Penang State Education A one day workshop for secondary school counselors was held at RECSAM, Penang. Facilitated by Ruth Liddle, South Korea Country Coordinator. 10 Aug, Penang: Talk on Keeping the Balance for a Caring Society Public Talk for parents and caregivers. Facilitated by Ruth Liddle, South Korea Country Coordinator. 9 Aug, Penang: Parenting Skills at Zhineng Qigong Center A session with parents and caregivers of young children. Facilitated by Ruth Liddle, South Korea Country Coordinator. 9 Aug, Penang: Youth Session A three and a half hour youth session in Penang. Facilitated by Ruth Liddle, South Korea Country Coordinator. 29 Jul 3 Aug, Oxford UK: LVEP International TTT The Malaysian contingent consisting of experts in the field of Early Years Education as well as management trainers attended the GRC TTT in 2003. One of the comments made about the TTT was that the atmosphere was one of so much unconditional love and giving. 7-8 June, Selangor: TTE for Peter& Jane Kindergarten After the training of all the teachers and staff, Patricia, the owner of the kindergarten, mentioned how much easier it was to manage the kindergartens with less conflicts and a more responsible staff. This session was facilitated by Shahida and Kana. 2-4 March, Selangor: TTE for Peter& Jane kindergarten and three of NICE's facilitators Initially five teaches from Peter & Jane Kindergarten attended this session. They recommended it to their principal. A second session was conducted involving all 24 teachers of their kindergartens including the principal and her parents! Session facilitated by Shahida, Kana and Hamidah. 20 June: LVEP introductory session for 150 headteachers arranged by the Education Department at Disted College, Penang. 21 June: How to instill values in children Part I: a three-hour LVEP workshop for parents. 21 June: How to bring out the best in LVEP kids without tears: a two-hour LVEP talk for parents. 22 June: LVEP introductory session for 68 teachers at Berapit Secondary School, Bukit Mertajam. 23 June: Bridging the Gap: a three-hour LVEP parenting workshop attended by 42 parents with separate values workshops for the17children and young adults who accompanied them. 25 June: How to instill values in children Part II: a three-hour LVEP workshop for parents 29-30 June: a two-day seminar, titled: Teaching Values in the ESL Classroom for 20 trainee teachers at Temenggong Ibrahim Teacher Training College, Johor Bahru, Malaysia. The workshop was sponsored by the English Studies Unit. In June 2001, there was a presentation to Assunta Primary Schools (1) & (2), Selangor at Parent-Teacher AGM and Staff Development Session, March 24 & 31, 2001. 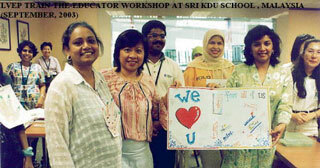 Led the LVEP Train-the-Educator workshop for Raffles Girls Secondary School in Singapore, March 12-14, 2001. In 2000, Shahida was the invited Speaker to share the Asian Experience at a workshop co-organized by UNESCO and LVEP on the subject of "Integrating Values in Early Childhood", Paris, November 20-22, 2000. 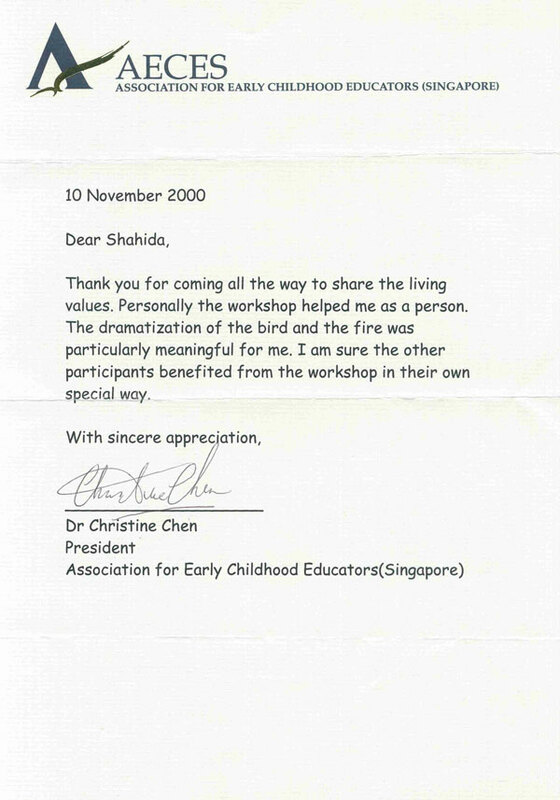 Led the LVEP Train-the-Educator workshop for the Association for Early Childhood Educators Singapore (AECES) in collaboration with LiVES Inc, October 20-22, 2000. Invited Speaker to share the Malaysia LVEP Experience at the Arab Regional Seminar: Quality-based Education organized by UNESCO's Beirut Office, Lebanon, May 15-17, 2000. Presentation to the National Union of the Teaching Profession (NUTP) general assembly meeting at Hotel Dynasty, Kuala Lumpur, January 29th 2000. 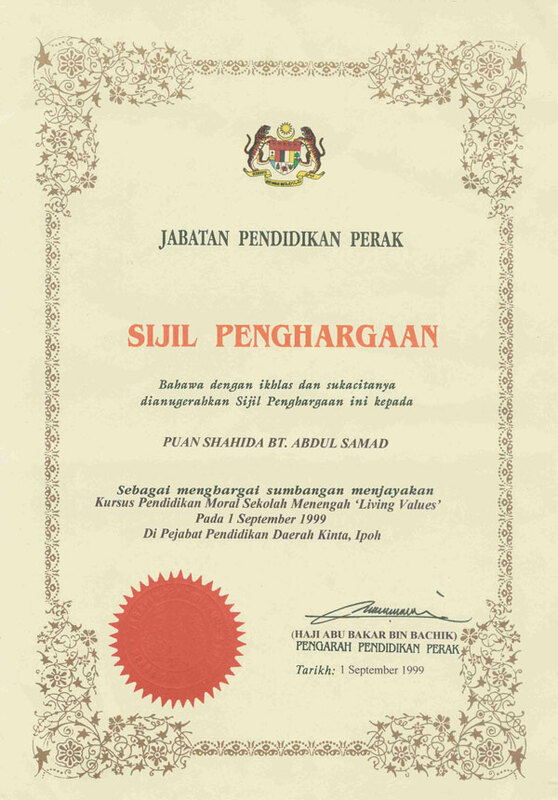 Co-organized a LVEP Train-the-Educator session for Moral Education Teachers with the Perak State Department of Education, September 1, 1999. Co-organized a LVEP Train-the-Trainer session with the Curriculum Development Centre, Ministry of Education at the Puteri Resort, Ayer Keroh, Melaka, April 19-22, 1999. 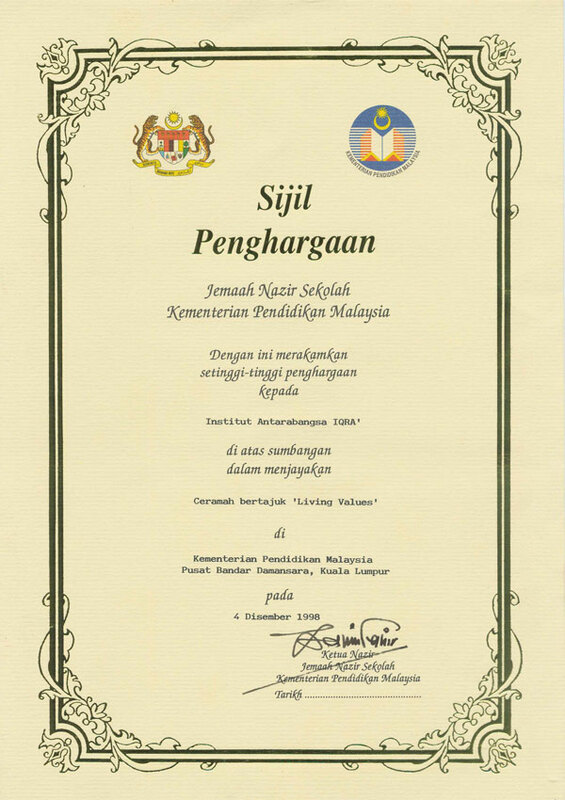 Presentation to Jemaah Nazir Sekolah (School Inspectors, Ministry of Education Malaysia), December 4, 1998. Presentation to Telekom Berhad on the importance of values-based educational approaches for the Smart School Project, May 18th 1998. NICE's Living Values Seminar Series - A Parenting Workshop, March 15, 1998. A number of certificates of appreciation have been given by various organizations. Kindly click on certificate for enlarged view. Shahida Abdul-Samad of Malaysia jointly conducted this Seminar in Beijing. Living Values has a core group of LVE trainers that travel around the world to conduct Training programs. Shahida Abdul Samad of Malaysia is the regional representative of the Living Values Education (LVE). She comes with an impressive international background in values training having worked with some of the world's largest multinational corporations such as Exxon Mobil Corporation and USA Today. She was instrumental in implementing the Vision and Values Program for Exxon Mobil Companies in Malaysia and implemented quality initiatives which brought about cost efficiencies and increased productivity in the organization. In the last 5 years, she has trained numerous educators and policy makers in the Living Values Education (LVE) worldwide. She has shared her knowledge and expertise with educators and policy makers in implementing values-based educational systems in Singapore (Association for Early Childhood Educators), Lebanon (at UNESCO's Arab Regional Seminar in Beirut on Quality Based Education), France (at UNESCO's International Workshop on Integrating Values in Early Childhood Programs) and more recently in Beijing (at the Beijing Institute of Education). Shahida also heads IQRA International Institute in Malaysia, a college of higher learning that stresses on values-based educational approaches. She sits on the Board of Directors of 3OPP, a local manufacturer and supplier of I.T. and telecommunication equipment. She obtained both her B.Sc. (Finance) and M.B.A. and graduated with Distinction from University of Nevada, Reno, U.S.A. She was recently accepted by Oxford University, U.K. to pursue her post-graduate work in values-based education. "Thank you for giving me this experience to learn and grow." " I really got to know myself better." "My knowledge of what beauty lies inside of people's mind and their imagination will help me carry out my job as a teacher more positively." "I benefited tremendously from the skills provided on how to create a values-based environment, active listening and conflict resolution skills." "The value activities are an excellent resource to help teachers help children in exploring and instilling their values." "The sessions made me aware of my own positive values and now I can put them into practice." "I never knew how to conduct a lesson on Peace until now"
"Now I have learnt how to resolve conflicts and to be an active listener. I am ready to use these skills immediately." Living Values Making Headlines in Malaysia!! Values-based education makes for a caring society. Teachers need to tap into pupils' creative energy.